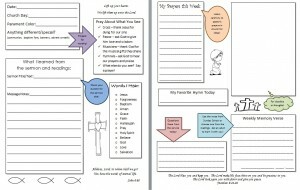 Emma Squire created a lovely set of worship resources to use with children to help them be involved in church services. You can read the post and download the original set of pages here. While we at the Sisters are largely liturgical and traditional in our churches, we know that some churches aren’t as familiar with the technical terms. With that in mind, this new version will be appropriate for churches that have people less familiar with liturgical terms. 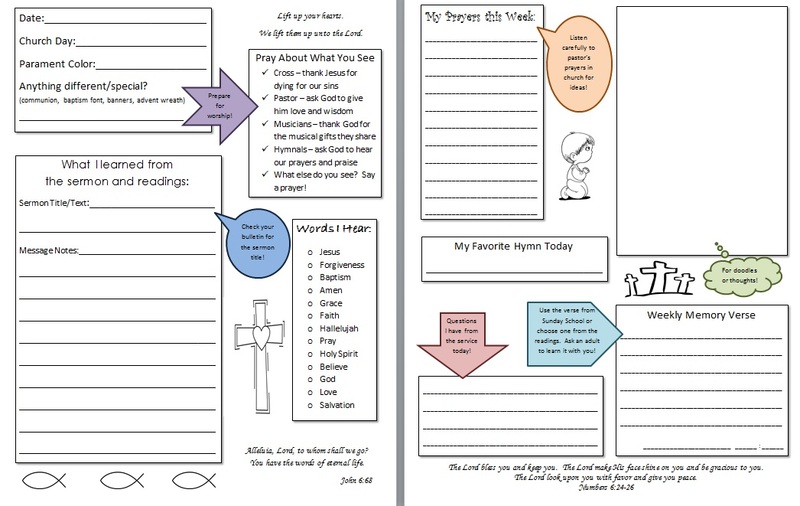 Emma has created a sweet teaching tool that will help learners old and new learn more about the worship service! Let’s help all of our kids learn and grow in faith and love for Christ! Thanks For this Resource. We have kids do Sermon notes for our confirmation and Day School program. We found them filling in generic info. to the point of asking did you make that up. This will help. Let me know if you were thinking of adding maybe a catechism question to look up section. Thanks This is great. Hi! Could you please send me this awesome sermon resource in Word? We would like to make it just a bit more mature for our catechism kids who are a bit older. We love your format- the colors and everything else. Especially, who will you pray for this week! Hi Tracey! What is your email address? I will send it your way! I absolutely love this! I serve as the Children’s Director in our church and would love to use this with your permission. Would you be able to send to me in a Word document so that I can modify it a tad for our children? You are very gifted!